With the last installment of Naughty Dog's tremendous Uncharted franchise hitting the shelves tomorrow, tie-ins were kind of an expected thing. The mobile tie-in game to Uncharted 4: A Thief's End is Uncharted: Fortune Hunter. Unlike many other mobile tie-ins, such as Dark Souls' horrendous Slashy Souls, Uncharted: Fortune Hunter is actually really, really well done. 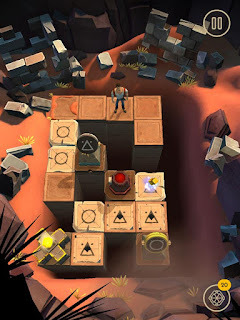 It does away with the 3rd person action game that the main series and Uncharted: Golden Abyss used and instead goes with a stylized top-down puzzle-game akin to games such as Hitman GO and Lara Croft GO. As Nathan Drake, players must navigate a series of single-screen trapped puzzles to obtain various treasures. Traps include rotating dart turrets, rising and falling pillars, and one-time use crumbling platforms. If the puzzle is completed in few enough moves you earn a gold key for extra bonuses that can be transferred for in-game use in A Thief's End. The same goes for all the gold you accumulate throughout the levels, they can be used to earn loot crates for extra goodies such as character outfits, weapon skins, boosters, and relics. There's even an in game store to buy a few extra outfits for Drake himself in Fortune Hunter. The game starts simple enough but reaches some real challenge whilst adding extra traps and mechanics at a steady increase. Difficulty ramps up a a decent pace and doesn't push too hard. Hints can be purchased with stones and gems found in the game through a help system if a puzzle gives you too much trouble. They are pretty low cost and shouldn't worry those having a tough time. The whole game is brilliantly handled, and to make it even better, the witty dialogue between Drake and his long-time treasure-hunting companion Sully is top notch entertainment throughout the game. Uncharted: Fortune Hunter is a surprisingly deep puzzle game with a ton of content, currently at around 200 levels with the promise of more "coming soon." It offers a wonderful new and interesting addition to the franchise on the go. Sure, it's a nice way to earn extras for Uncharted 4, but it's fun and enjoyable as its own game as well. It's got great graphics, great controls, and great sounds- it is an all-around great game- plain and simple.